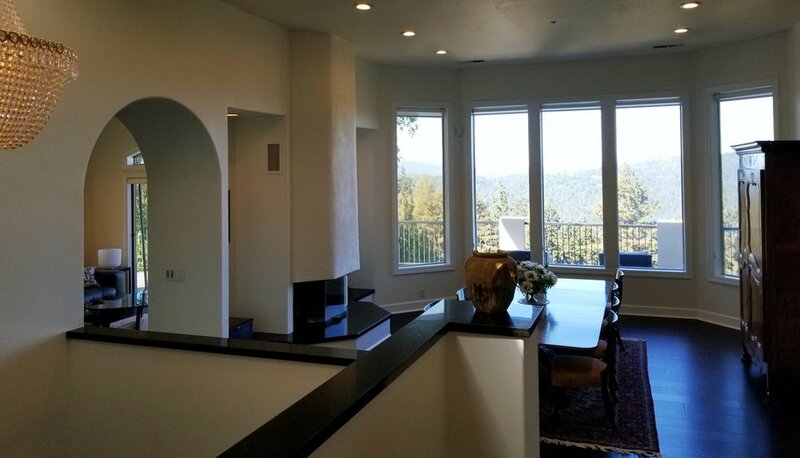 Cliff House is a 5000 sq ft home, perched 2,200 feet above the surrounding Pacific and Silicon Valley areas, and conveniently located in the wine country of the Santa Cruz Mountains. We provide a luxury residential experience for our guests. Up to four couples may be accommodated in separate, beautiful, private suites. The area is 25 minutes from both Silicon Valley and the beaches of Santa Cruz. The nearby wineries have always been a frequent destination for people throughout the Bay Area who want a vineyard experience on par with Napa Valley, but without the distance, crowds or prices. The residence is structured like a boutique hotel, with private suites available on the lower floor and with a large, luxurious common area above. There is a gorgeous 2000 square foot slate deck overlooking the vineyards, canyons, mountains and the Santa Cruz area. This is the marine layer rising 1500 feet over the Pacific. There is a unique and dramatic view from Cliff House every day.